Manufacturer & Exporter of a wide range of products which include Aluminium Scaffold Rental Services such as Aluminum Mobile Tower Scaffold Hire and Tower Scaffold Hire. 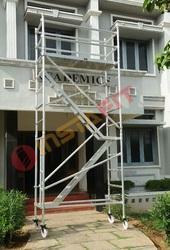 We have gained expertise in offering a quality approved array of Aluminum Double Width Mobile Scaffold without Stair. 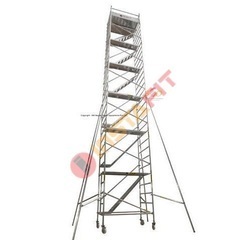 The Mobile Double Width Scaffold Towers we offer is known for their precise use. These products are tested for their quality before being dispatched in the market. Stairway rails add to the all round safety. 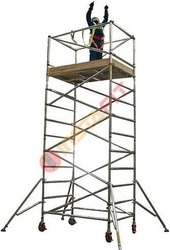 No tools required, Spacing of platforms every 2 meters (Optional) ease is assembling or dismantling of the tower. 750mm 1000mm Single width, 2.0 1.8m long slip resistant deck. Maximum load capacity 275 kgs upto 4m. Primed brace claw mechanism Floating frame spigots. Easy to use toe board system. Castors with locking brake mechanism, Castor wheels size 6". 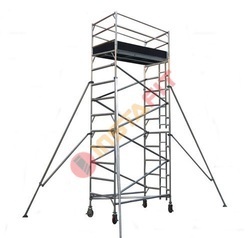 We have gathered a huge customer base in this domain by presenting a comprehensive range of Folding Scaffold Towers. Tightening the anchor in ship, wires, cables, pipe lines, and a variety of industrial machinery parts require such towers to help technicians do their jobs. These towers look robust and reliable. Also, these towers are manufactured using stainless steel and iron alloys. Our professionals ensure to provide better solutions to the ladder towers by adhering to industry norms and using advanced machinery for dimensional accuracy. It can be assembled very quickly, without tools, as it is made of an extremely resistant lightweight aluminium alloy: rust cannot corrode this material which is long-lasting. It is safe and suitable for heavy duty use. The working platforms are lightweight and extremely strong, it is made up of an aluminium frame and a wooden board which is non-skid and weatherproof painted. The aluminium self-locking hooks that snap automatically onto the rungs. The hooking edge is reinforced to make it shockproof. 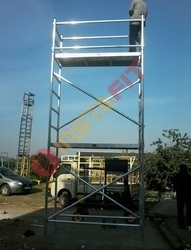 We are offering Aluminium Mobile Tower Scaffold Hire in chennai and supplying our products to all over south India for sale and rental. With well experience in the same industry we are supplying quality products to our customer. Owing to their distinctive features, these find wide applications in diverse industrial and commercial areas. Further, these are available in customized designs as per varied requirements of clients. Looking for Aluminium Scaffold Rental Services ?